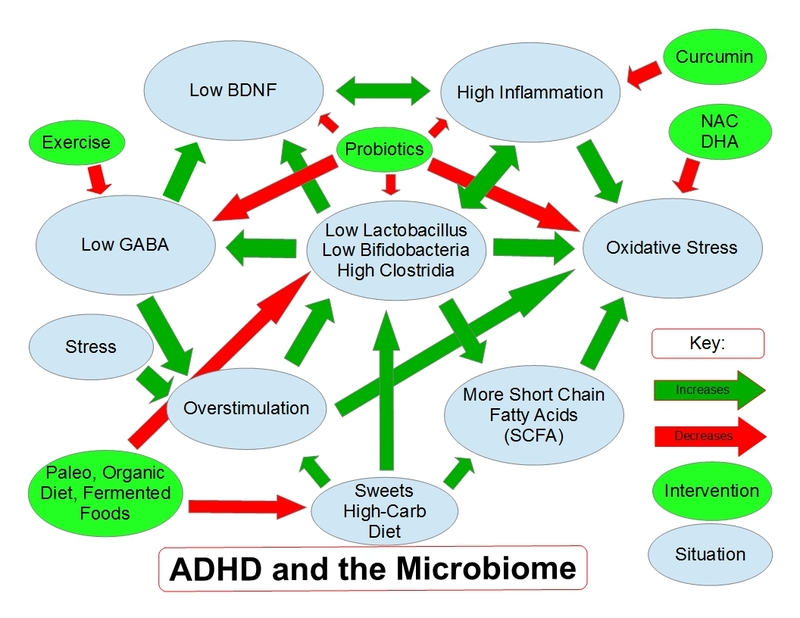 ADHD and the Microbiome: Any useful connections? Life sometimes keeps us quite busy, doesn’t it? I apologize to you, my readers, for the scarce blog posts. I’ve been in the process of pulling off an epic home move of about 1700 miles! So, I write this post while in a campground in Lamoine, Maine USA where I’ve been hunting up a new home for my family and I.
I did quite a bit of research reading about ADHD recently, and thought I would share a few thoughts about it. Most of these thoughts are summarized in the flow chart drawing I created; refer to it when reading this blog post and you’ll see what I mean. What can be learned from a simple uBiome stool sample that can help with ADHD? Well, it turns out that there is quite a bit to look at there! As usual, this isn’t meant to replace your physician’s advice, and it is an example-which may not exactly describe your situation. You should consider using uBiome to run your (or your child’s) sample to see what your particular situation consists of. The first thing to consider is the imbalance that frequently occurs in a microbiome. You see, it isn’t just about how many species of bacteria live in your gut, it is also about the relative numbers of those species. uBiome, after processing your sample, shows this in the simplest way by clicking on Taxonomy tree. In this format, the larger circles indicate larger populations while the smaller ones indicate, well, smaller. Clicking on each allows one to expand the data down from the phylum level all the way down to the genus level (remember, all life is cataloged by Kingdom, Phylum, Class, Order, Family, Genus, Species. We usually use Genus, Species to identify organisms, such as Homo sapiens or Helicobacter pylori.) When expanding these circles, often there is an obvious imbalance. At this point, I’m going to share some very specific information, and some or all of it may not apply to you or your child. It is an example of how a uBiome analysis can correlate with a condition and symptoms, directing some interventions. One recent patient case was a good example; the only large circles were Firmicutes, which is not such a bad thing. Opening that led to Clostridia being dominant, while Bacilli was minimal. This is meaningful because Bacilli includes Lactobacillus-one of the definite “good guys” that keep things working well. The phylum Actinobacteria was also minimal, significant because it includes another desirable genus, Bifidobacterium. This organism is an initial colonizer of the gut, tames the immune system, and also works with Lactobacillus to produce BDNF. BDNF stands for Brain Derived Neurotrophic Factor, and it is necessary for the brain to develop new connections and grow/adapt to the life an individual leads. It is needed for plasticity, that ability of the brain to learn and adapt as needed. Low levels of BDNF are associated with ADHD. Your microbiome helps your brain to produce BDNF. Remember that a big part of what your brain learns to do as you grow up is actually blocking things out, not paying attention to more of them. It is a learning process, and in order to concentrate to accomplish tasks we must learn to attenuate non-essential information. This is also necessary for the brain to conserve fuel, because having a neural response to every incoming signal would burn a lot of fuel-in fact, enough to run out in some areas and cause Oxidative Stress. Oxidative stress can result from depressed levels of antioxidant reserves or from too much stimulation. When nerve cells get overstimulated, they build up waste products and the energy-producing mitochondria become damaged. This is a “cellular death spiral”, because as soon as the mitochondria become damaged, the cell’s capability to metabolize fuel and produce energy is compromised, leading to more oxidative stress and further damage. This has been identified as part of the disease process in Alzheimer’s and Parkinson’s as well as ADHD and Autism. 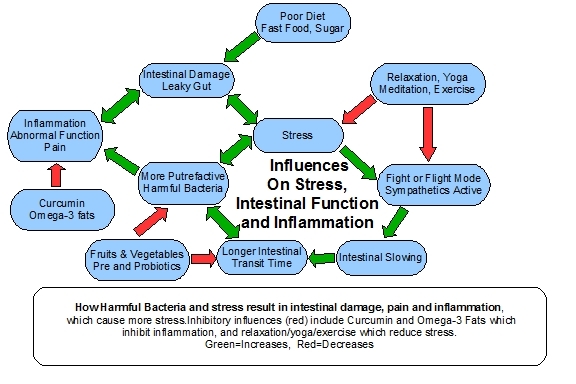 One of the problems that can promote Oxidative Stress is Inflammation. Inflammation occurs when the immune system become too reactive and begins to attack tissue that is “self” and not “intruder/enemy”. Bifidobacteria are known for helping to dampen the immune inflammatory response, and a deficiency of Bifido contributes to inflammation. Again, inflammation is a key building block of…yes, all the same neurologic diseases. Low levels of Bifidobacteria and Lactobacillus are also significant because these organisms produce a neurotransmitter called Gamma Amino Butyric Acid or GABA. GABA is an inhibitory neurotransmitter in the brain, and calming drugs or herbs often boost GABA levels. Valerian root or Valium (copycat drug companies, you know?) are good examples as is Kava Kava. Low levels of Lacto and Bifido gut bacteria result in low levels of GABA at the brain. Low levels of GABA at the brain result in less inhibition…ergo, more stimulation! And, the process continues in a positive feedback loop. It is interesting to note that one intervention that helps elevate GABA and BDNF is exercise. Kids with ADHD are known for often being hyperkinetic, so if you wondered why, it is their brain’s way of balancing the equation to save nerve cells! When kids are reprimanded by teachers and parents are shamed into medicating their children’s “high energy”, it can be detrimental to the developmental process for this reason. This doesn’t mean that doing nothing is better, as a child must be able to focus in order to be able to learn. It just means that medicating their energy level down does not address the root causes of the problem. So, what would be some natural interventions? First, improved nutrition. Any food that is causing more inflammation needs to be removed from the diet. Often that is sweets (note that Clostridia like sweets) and sometimes specific items such as gluten containing foods. Adding probiotics that contain the Lacto and Bifido organisms (in this patient example) can of course be helpful, but more so if they are also fed the prebiotic fibers that they need to survive (again, ideally this is case-specific). Both can be added to a fruit and vegetable smoothie that is tasty. 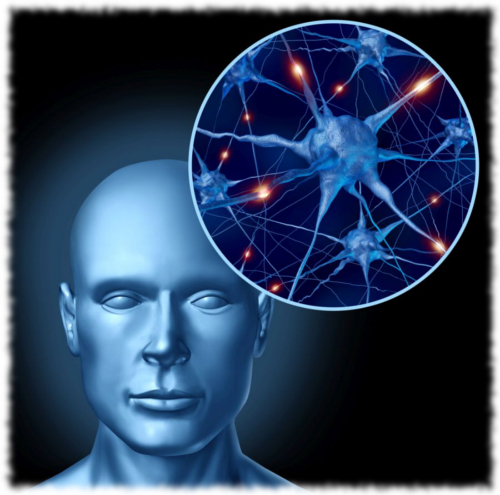 Neuroprotective supplements such as N-Acetylcysteine will help to minimize the neuronal damage that is occurring. Also DHA/Omega-3 oils are neuroprotective and have been shown to help with ADHD. Curcumin can also reduce the neuroinflammation and is protective as well. It can also help settle gut function and heal the membranes of the intestines if they were inflamed too. Eating less processed food and more fresh (organic as possible) fruits and vegetables helps. All of these steps are best carried out after having a stool sample analyzed for gut bacteria. Only after seeing the “bacterial census” is it possible to be extremely specific. A different patient’s samples could result in different recommendations! Please contact me for more details should you wish to find out more or schedule an analysis. This does not have to be done locally, as I only need the data from uBiome and a patient questionnaire to determine recommendations. Some of the supplements recommended are not case-specific, such as NAC, DHA/Omega and Curcumin as these will help most types of situations as will a healthier diet. The probiotic formulation is ideally case-specific, as is the prebiotic fibers and these will preferentially feed some categories of organisms more than others. With proper lab work and specific interventions, it is possible for many individuals with ADHD to control and manage their situation more effectively. For some, it will be more of a cure, with no medication needed. For others, it may mean less medication is needed or the medication works more effectively. It is important to realize that we are all different, and our situations are also different! Sources for supplements: http://progressivelabs.com/ You’ll have to register to order from them, and it requires specifying who referred you. Please feel free to put my name on that line, and then you will be able to receive your supplements directly from the same manufacturer I use! TNF-alpha inhibition prevents cognitive decline and maintains hippocampal BDNF levels in the unpredictable chronic mild stress rat model of depression. Şahin TD, Karson A, Balcı F, Yazır Y, Bayramgürler D, Utkan T.
Effect of dietary supplementation of Bacillus subtilis B10 on biochemical and molecular parameters in the serum and liver of high-fat diet-induced obese mice. Lei K, Li YL, Wang Y, Wen J, Wu HZ, Yu DY, Li WF. J Zhejiang Univ Sci B. 2015 Jun;16(6):487-95. doi: 10.1631/jzus.B1400342. Enteric short-chain fatty acids: microbial messengers of metabolism, mitochondria, and mind: implications in autism spectrum disorders. Microb Ecol Health Dis. 2015 May 29;26:28177. doi: 10.3402/mehd.v26.28177. eCollection 2015. Clinical trials of N-acetylcysteine in psychiatry and neurology: A systematic review. Deepmala, Slattery J, Kumar N, Delhey L, Berk M, Dean O, Spielholz C, Frye R.
Neurosci Biobehav Rev. 2015 Aug;55:294-321. doi: 10.1016/j.neubiorev.2015.04.015. Epub 2015 May 6. Review. Gastrointestinal dysfunction in autism spectrum disorder: the role of the mitochondria and the enteric microbiome. Frye RE, Rose S, Slattery J, MacFabe DF. Microb Ecol Health Dis. 2015 May 7;26:27458. doi: 10.3402/mehd.v26.27458. eCollection 2015. Comparing interval and continuous exercise training regimens on neurotrophic factors in rat brain. Afzalpour ME, Chadorneshin HT, Foadoddini M, Eivari HA. Physiol Behav. 2015 Aug 1;147:78-83. doi: 10.1016/j.physbeh.2015.04.012. Epub 2015 Apr 11. Probiotics as potential antioxidants: a systematic review. Mishra V, Shah C, Mokashe N, Chavan R, Yadav H, Prajapati J.
J Agric Food Chem. 2015 Apr 15;63(14):3615-26. doi: 10.1021/jf506326t. Epub 2015 Apr 6. Increased levels of plasma glial-derived neurotrophic factor in children with attention deficit hyperactivity disorder. Shim SH, Hwangbo Y, Yoon HJ, Kwon YJ, Lee HY, Hwang JA, Kim YK. Evaluation of improved γ-aminobutyric acid production in yogurt using Lactobacillus plantarum NDC75017. Shan Y, Man CX, Han X, Li L, Guo Y, Deng Y, Li T, Zhang LW, Jiang YJ. J Dairy Sci. 2015 Apr;98(4):2138-49. doi: 10.3168/jds.2014-8698. Epub 2015 Jan 23. The role of the brain-derived neurotrophic factor genotype and parenting in early life in predicting externalizing and internalizing symptoms in children with attention-deficit hyperactivity disorder. Park S, Kim BN, Kim JW, Jung YK, Lee J, Shin MS, Yoo HJ, Cho SC. Behav Brain Funct. 2014 Nov 25;10:43. doi: 10.1186/1744-9081-10-43. Mayer EA, Knight R, Mazmanian SK, Cryan JF, Tillisch K.
J Neurosci. 2014 Nov 12;34(46):15490-6. doi: 10.1523/JNEUROSCI.3299-14.2014. Review. The Physiology of BDNF and Its Relationship with ADHD. Liu DY, Shen XM, Yuan FF, Guo OY, Zhong Y, Chen JG, Zhu LQ, Wu J.
Excitatory GABA induces BDNF transcription via CRTC1 and phosphorylated CREB-related pathways in immature cortical cells. Fukuchi M, Kirikoshi Y, Mori A, Eda R, Ihara D, Takasaki I, Tabuchi A, Tsuda M.
The effects of gut microbiota on CNS function in humans. Gut Microbes. 2014 May-Jun;5(3):404-10. doi: 10.4161/gmic.29232. Epub 2014 May 16. Review. Prevention of cerebral palsy, autism spectrum disorder, and attention deficit-hyperactivity disorder. ROS and brain diseases: the good, the bad, and the ugly. Popa-Wagner A, Mitran S, Sivanesan S, Chang E, Buga AM. Oxid Med Cell Longev. 2013;2013:963520. doi: 10.1155/2013/963520. Epub 2013 Dec 5. Review. Brain Behav Immun. 2014 May;38:1-12. doi: 10.1016/j.bbi.2013.12.015. Epub 2013 Dec 25. Review. BDNF mediates adaptive brain and body responses to energetic challenges. Trends Endocrinol Metab. 2014 Feb;25(2):89-98. doi: 10.1016/j.tem.2013.10.006. Epub 2013 Dec 19. Review. Oxidative Stress and ADHD: A Meta-Analysis. Joseph N, Zhang-James Y, Perl A, Faraone SV. Prebiotic feeding elevates central brain derived neurotrophic factor, N-methyl-D-aspartate receptor subunits and D-serine. Savignac HM, Corona G, Mills H, Chen L, Spencer JP, Tzortzis G, Burnet PW. Neurochem Int. 2013 Dec;63(8):756-64. doi: 10.1016/j.neuint.2013.10.006. Epub 2013 Oct 16. Exercise ameliorates cognition impairment due to restraint stress-induced oxidative insult and reduced BDNF level. Kwon DH, Kim BS, Chang H, Kim YI, Jo SA, Leem YH. Biochem Biophys Res Commun. 2013 May 3;434(2):245-51. doi: 10.1016/j.bbrc.2013.02.111. Epub 2013 Mar 25. Attention deficit and hyperactivity disorder scores are elevated and respond to N-acetylcysteine treatment in patients with systemic lupus erythematosus. Garcia RJ, Francis L, Dawood M, Lai ZW, Faraone SV, Perl A.
Arthritis Rheum. 2013 May;65(5):1313-8. doi: 10.1002/art.37893. Effect of n-3 supplementation on hyperactivity, oxidative stress and inflammatory mediators in children with attention-deficit-hyperactivity disorder. Hariri M, Djazayery A, Djalali M, Saedisomeolia A, Rahimi A, Abdolahian E.
Malays J Nutr. 2012 Dec;18(3):329-35. Psychiatric disorders and mitochondrial dysfunctions. Marazziti D, Baroni S, Picchetti M, Landi P, Silvestri S, Vatteroni E, Catena Dell’Osso M.
Eur Rev Med Pharmacol Sci. 2012 Feb;16(2):270-5. Review. Chronic treadmill running in normotensive rats resets the resting blood pressure to lower levels by upregulating the hypothalamic GABAergic system. Hsu YC, Chen HI, Kuo YM, Yu L, Huang TY, Chen SJ, Chuang JI, Wu FS, Jen CJ. J Hypertens. 2011 Dec;29(12):2339-48. doi: 10.1097/HJH.0b013e32834c628f. Ng F, Berk M, Dean O, Bush AI. Int J Neuropsychopharmacol. 2008 Sep;11(6):851-76. doi: 10.1017/S1461145707008401. Epub 2008 Jan 21. Review. This entry was posted in Uncategorized and tagged ADD, ADHD, attention deficit hyperactivity disorder, BDNF, bifidobacterium, brain, breastfeeding, curcumin, GABA, inflammation, lactobacillus, microbiome, neurodegeneration, oxidative stress, ubiome on July 19, 2015 by Dr. Richard Matthews. What’s the perfect diet to host as healthy a microbiome as possible and live a healthy life? well, that turns out to be different for each person…our microbiome and our body live in a balance, with “the ideal microbiome” depending on several variables. How do you figure it out? That is going to be the subject of my next book! I know that there are so many books about diet, and this is not going to be one of them. It will be more about how to understand your body, making useful observations, deciding what tests to have run, understanding what those tests mean and deciding what to change to op I realized that I did not include much information about what to do in The Symbiont Factor. 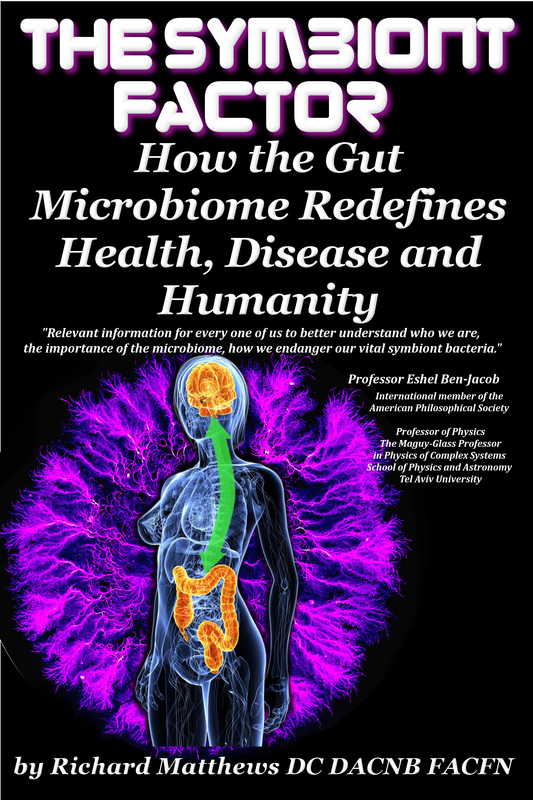 I wrote it more to set the stage by understanding the role of the microbiome in health; why it’s important in other words. If you’re making your way through the book or have already finished it, you will understand what is coming in the next book much better! This entry was posted in Uncategorized and tagged ADD, ADHD, gaps, gut bacteria, humira, inflammation, kefir, microbiome, ra, remicade, rheumatoid arthritis, symbiont, the symbiont factor, thesymbiontfactor, tnf, yogurt on April 18, 2015 by Dr. Richard Matthews.